A Chinese parable tells of an old man who lived with his son in an abandoned fort. One night the old man’s horse, the only one he had, wandered away. His neighbours all came to say how sorry they were about his misfortune. He replied, “How do you know this is ill fortune?” A week later the horse came home, bringing with him a herd of wild horses. The neighbours came again, helped him capture the wild horses, and congratulated him on his good fortune. As the days went on, the man’s son began to ride the horses. One day he was thrown and ended up with a crippled leg. The neighbours appeared again to tell him how sorry they were about his bad luck, but the old man asked, “How do you know it is bad luck?” In a few days along came a Chinese warlord who conscripted all able-bodied men for his private war. But the old man’s son, because of his injury, missed the draft, and once more came the neighbours to rejoice with him in his good fortune. That saying, “don’t just sit there, do something”. We get up in the morning, make the kid’s breakfast, have a coffee, get dressed, drive to work, wave to the school crossing guy, turn onto to Fitzroy street without properly stopping at the stop sign etc., etc., etc. and another day is done. Sometimes we need to take a step back and “not just do something, but to sit there” and for a moment ponder the amazing things taking place that have become hidden behind the monotony of life. If we look and listen, we see amongst it, there is much, much more going on. Where each moment can offer the splendour of life. As Christians, we believe in the God of the “much more”. When Jesus made clear to his followers that he would be returning to his Father and that they, in turn, would be persecuted, they were plunged into grief. So he went onto say more about the Holy Spirit whom he would send as their Counsellor and Advocate. Jesus said: “I have much more to tell you, but now it would be too much for you to bear. But when the Spirit of truth comes, he will lead you into all the truth”. Jesus early followers, like us can find things puzzling and hard to bear. The pain and the hurts of life, and the treeless never ending roads or seemingly dead ends of our lives. Yet amongst it all, the Holy Spirit is God active. He is God in and with us and continues to illuminate the work and truth of the Son, our Saviour Jesus Christ. The truth of our Saviour that brings light to dark places and dark lives. The truth that puts us at ease with the mysteries of life. To help us live amongst life’s unexplained anguish’s and ecstasies, our lives highs and lows. The Holy Spirit brings us divine insight into the truth. The truth of Christ. How he sees and understands our trials and pleasures, our plans and our problems. And we come to see through it all that nothing can separate us from the love of God. Through the Holy Spirit we see that God is real for us. See that he is nearer to us than breathing and closer than hands and feet. Christ is life and the Holy Spirit brings us his life. Brings us the truth because Jesus said the Holy Spirit “will not speak on his own, but will speak of what he hears and will tell you of things to come”. “Things to come” are possibilities for the future. They are expectations yet to be fulfilled; they are hopes yet to be realised. “Things to come” include what is coming to the world and who is coming to the world. On one hand they refer to things such as the end of the world and the final return of Jesus Christ and the arrival of the new heavens and earth. They include the resurrection, the judgment and eternal life. They point to the victory of Christ the lamb upon his throne. They inspire the vision of multitudes without number singing, Worthy is the lamb that was slain to receive power, and wisdom, and strength, and honour and glory and blessing. On the other hand, “things to come” refers to the possibilities open to us and to humankind because of God. That no matter what our circumstances the Holy Spirit enlivens us with the certainty of Christ being with us and his beckoning words that point us toward heaven and his beckoning words that teach us and support us in living in the here and now. The Holy Spirit brings us the truth of our God active today and the God of all our tomorrows. The truth of our Saviour Jesus Christ standing with us. We see Christ open the door for us that no person can shut and we see him walking through it with us. And when, at times, life seems meaningless or empty and the future closed, the Holy Spirit asks us to look to Christ and see what he has given us. The gift of eternal life in faith in him alone, which in him alone brings the gift of all our todays. One very cold winter’s night a young boy and his father were walking along a dark path to a neighbouring farmhouse. The boy was afraid even though his father had a lantern. He saw that the light of the lantern reached only a short distance. But his father reassured him that if they kept on walking, the light would keep on shining to the end of the road. So it is with the Word of God as revealed to us in the sacred Scriptures by the Holy Spirit. If we keep on walking in the light of his truth we will be sustained because it is His promises that take away our guilt, our fears and sadness. And though we cannot see the ascended Jesus with our physical eyes, he has not left us alone. He gives us his Spirit, who comes to us in Word and Sacrament, assuring us of God’s love, forgiveness and presence in your lives. You never walk alone and that is what brings Joy and sure hope, because he is Joy and sure hope. So tomorrow, when I’m about to turn onto Fitzroy street with my good friend Jesus next to me, I might actually properly stop at the stop sign and let him show me the beauty that he has placed before me. Amen. This morning we have two very important things going on as a part of our worship service. The most obvious is that today is Confirmation Sunday. For a lengthy time Emily, Ange, Matthew, Amy and Lilli have gone through careful instruction with Jenny and me in the basics of the Christian Faith. We’ve used the doctrine of the Scriptures as taught in Luther’s Small Catechism as the basis for our instruction, and they have learned about the faith that they will confess as their own today. It’s a big day! In some cases, you have friends and relatives that have travelled a long ways to be here. While Confirmation Sunday is a big day in the life of our Lutheran congregations, that’s not the only big event we remember today. Today is also the Day of Pentecost. In our reading from Acts 2 and the Gospel reading from John, we hear about the promise of the coming of the Holy Spirit, and the fulfilment of it in Acts. This morning, we’re going to look at that first Pentecost, and see why it’s such a big deal to us today, and why that event can give our confirmees a lot of confidence as they go out living their lives in the Christian faith. Sometimes Pentecost can be one of the days of the church year that some may say that Lutherans are out of touch with. Some, even from within our wider church say that we don’t talk enough about the Holy Spirit, that what we believe, teach, and confess is dead, that we’re not “alive” like other churches seem to be. And I spose talk of the Holy Spirit in regards to tongues of fire, and strange languages can be confusing and even misconstrued. So sometimes we do decide that it is easier to not really talk about Pentecost, or what happened on that day. Well this morning, we are going to talk about Pentecost, and we’re going to talk about the Holy Spirit, but we’re going to see how the Holy Spirit truly works, and what it has to do with our confirmees, and with us. To start off with, let’s discover what the Holy Spirit’s work is. It has been 10 days since Jesus had ascended into heaven. Just prior to His ascension into heaven, Jesus told his disciples to stay in Jerusalem and wait for the coming of the Holy Spirit, who would empower them to be Jesus’ witnesses in Jerusalem, all of Judea and Samaria and to the ends of the earth. They spent that time together, devoting themselves to prayer and meditating on the Word that Jesus had given them. Then it happens. A sound of a rushing wind filled the room where the Disciples were. A pretty extraordinary event I would think! But there’s more. Next, tongues of fire descend over the disciple’s heads. Pretty impressive and needless to say, it’s going to grab a LOT of attention. This is all taking place at the Jewish Pentecost festival, which was one of the major festivals Jewish men were expected to return to Jerusalem for. So you have devout Jews from every tribe and place in the city. This sets the stage for what happens next. 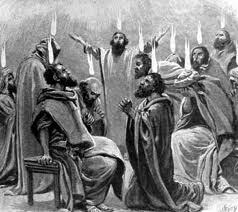 The apostles come out, and start speaking in other tongues as the Spirit gave them utterance. In other words, the disciples come out, and they start speaking other known languages. Languages that they had never spoken before, and so understandably the Jews who where there were saying “Are not all these who are speaking Galileans? So how is it that we hear, each of us in his own native language?” It’s obvious something big is going on! They’re telling the good news about Jesus to all of these people in the language that they can understand! This isn’t the kind of “speaking in tongues” that is on the radar these days, but as in the scripture here, “tongues” refers to speaking in known languages that hearers can understand. In the midst of all of this, Peter gets up and starts preaching a sermon. He tells them that what is going on is the fulfilment of a prophecy in Joel, and points them to Jesus, the one that they had put to death, who was the long awaited Messiah. Later in the chapter, we’re told that Peter’s audience is cut to the heart by the preaching of the law, and ask what they are to do. Peter tells them to repent and be baptized in the name of Jesus Christ for the forgiveness of their sins, and that this gift was for them, and their children, and for all who were far off, everyone whom the Lord would call to himself. Then we’re told that 3,000 people were baptized and added to the church that day, and that they continued to gather around the apostles’ teaching, and the breaking of the bread, in other words, they gathered around the preaching of the Word and the Sacrament of Holy Communion on a regular basis. And the Lord added to their number day by day those who were being saved! Quite a day and you can read into the text a lot of fervour and zeal in those early Christians. That had to have been an exciting day to be a part of! 3000 people heard the Gospel preached to them in their own language, believed, and were baptized. When we compare that, life at our little Lutheran Church’s seems to be pretty dull, and because of that, we maybe led to despair sometimes and wonder if we have the Holy Spirit like other churches do. So, do we have the Spirit at St. Marks and St. Johns? And are we allowing the Holy Spirit to work? To find the answer, let me ask you a couple of questions. What are we missing from that day of Pentecost? Well, we didn’t have a loud rushing wind fill the building this morning. And as I look out at the congregation, I don’t see any tongues of fire dancing atop anyone’s heads, and I doubt you’ll see that when our confirmees publically confess their faith in the Rite of Confirmation. But what do we have? The furniture you see in the front of this church will give you that answer. You see the pulpit and lectern, where the Word of God is read from and proclaimed to you, telling you that we have the Apostles’ teaching, the Word of God that is read and proclaimed. You see the Baptismal Font, telling us the same baptism that was given to those 3,000 people that day is given here. And, you see the altar, where we receive the sacrament of the Lord’s Supper: the body and blood of our Lord. So if you ask me, we have what’s necessary to forgive sins and bring eternal life, we have Word and Sacrament. You see, when something big happened in God’s plan of salvation in the Bible, He kicked it off with something special: at the crucifixion, darkness covered the land, the temple curtain was torn in two, and the earth shook. At the Resurrection, the stone was rolled away. Here at Pentecost, when the Holy Spirit that Jesus had promised the disciples would come in the Gospel reading arrived, it is announced with the rushing wind, tongues of fire, and the gift of languages. Those things didn’t give forgiveness of sins, life, and salvation. God’s Word, Holy Baptism, and Holy Communion did and still do. Those are the means that the Holy Spirit worked through to bring people to faith, and to strengthen the faith of those who already believed. So could it be? Could it be that what we’ve been doing in believing that the Old and New Testaments are the inspired, infallible Word of God, and that the Word, attached to water in Holy Baptism and bread and wine in Holy Communion, without gimmicks and fads attached to them, is exactly what those early Christians in Acts 2 were doing? Could it be that the problem isn’t with the Scriptures, or the doctrine that these young people have come to learn in Luther’s Small Catechism, but that the problem is with us, in wanting to squelch the Spirit’s work by our own emotions, ideas, or activity, looking for the Spirit in places He has not promised to be found? Yet, some might say, 3,000 people were baptized after one sermon, without having to spend a year of careful instruction with a Pastor studying the doctrine of the Scriptures! Something powerful had to be going on! Well it was but let’s put it into proper perspective. Pentecost was a major Jewish festival that would bring many Jewish men into Jerusalem. Historical record apart from the Scriptures tells us that Jerusalem’s population would swell to up to one million or more during such times. Not only that, but the text tells us these were devout Jews, men who were well schooled in the Word of God, they knew everything there was about the Messiah expect one thing, his name. Now, if you do the math, if we have 1 million devout Jews in the city at Pentecost, and 3,000 of them hear the message proclaimed to them in their own language, and they are baptized, then that means 3 one-thousandths of one percent of the Jews in Jerusalem heard the message, believed, and were baptized. If you were to talk to a supposed church growth expert today with a statistic like that, they may call the Pentecost event a failure. For you confirmees, today it is going to be easy to promise that you will remain faithful in the Christian faith. But, the tough part happens the moment you walk out of that door. Statistically speaking, half of you will eventually stop coming to church in your high school years. You’ll find the allure of sports, late Saturday nights with friends, or other things in the world to be more important than being strengthened in your faith in church where Christ is present with His gifts of Word and Sacrament. You’ll be tempted with this sin and that sin, and have the world tell you that what you learned in the Bible isn’t really relevant anymore. You’ll be tempted to look for God in places He hasn’t promised to be found. You’ll be tempted to turn your back on Word and Sacrament because they’re not flashy, or entertaining in the eyes of the world. But, there’s a great danger in that! When you ignore these means that the Holy Spirit promises to work through, you are setting yourself up to be tricked in regards to the truth of Christ’s gifts. And eventually, you will risk being starved out of your faith. But that plea isn’t just for our confirmees, it’s also for all of us here. Don’t go looking for the Spirit in places He has not promised to be. Sometimes, we’re tempted to fall into a phrase I heard as “Lutheran Shame”, in that we’re led to believe that our doctrine and practice isn’t all that exciting, and so we go and look at other churches, and see what they’re doing that seems more alive, and want to adopt their methods without first going to the Word of God to find out if they are scriptural or not. We’re often tempted to believe that the Spirit won’t work through these means and try to come up with our own methods to cause the Holy Spirit to come and work. When that happens, we forget that the Holy Spirit works through means, that He has promised to work faith through the Word and the Sacrament when and where He wills. There are times and places where mission work is slow, and other times and places where it is fertile. Paul sometimes would preach, and have several converts, while other places; he would nearly be stoned to death. In our world of instant gratification, it’s tempting to get discouraged in the church-and if you think of the struggles of our ancestors and their missionary activities into Northern Territory and PNG we could imagine it would have been tempting to have given up. But those early Pastors and Christians knew that the Holy Spirit works through the means of Word and Sacrament, and in God’s timing, congregations began from those seeds that were planted during that time. Don’t get caught up in a statistical report, or a dollar sign to measure a church’s mission. We’re called to measure it by if that church or mission is proclaiming the Word of God in its truth and purity, and if the Sacraments are being administered to the Word of Christ, and let us repent when we use any other means to try to bring about the work of the Holy Spirit. To confirmees today, while your confirmation instruction has ended, your life of hearing the Scriptures preached to you is only just beginning. I want to encourage you to continue to allow the Spirit to point you to Christ through the Word and through the Sacraments. Continue to come here on Sunday mornings, be fed through God’s Word and Sacraments, where the Spirit will convict you of your sins, and point you to Christ crucified, who through His life, death, and resurrection, has won forgiveness, eternal life, and salvation for you. Continue to read your Bibles at home and don’t be afraid to come by my office and ask me the tough questions. We’ll sit down together, and find the answers in the Word of God. And for the rest of us, the Day of Pentecost is a challenge for us to remain faithful to the doctrine we have learned from the Scriptures. Be encouraged in that being a church that remains faithful to Word and Sacrament ministry, is being an Acts 2 type of church. Be encouraged in the knowledge that the Holy Spirit is at work here. Even though the means may not be that flashy, we have the promise from God’s Holy Word that the Spirit is here, through the Word, through Holy Baptism, through Holy Communion to convict us of our sin, and to point us to our Saviour, Jesus Christ, and to either bring us to faith in Christ, or strengthen our faith in Christ. What could be more exciting than that? May God grant that to us for Jesus’ sake. Amen. Two of the most confusing years of my life were my first the seminary studying to be a pastor. For an older student the languages and doing assignments it was a culture shock and difficult. So yes, the doing “stuff” was at times difficult. But the confusion was from within because I continually self-doubted whether I was meant to be there. I wanted so much to do what God had wanted me to do but kept thinking that maybe I had misinterpreted just what that was, and maybe it was my own human construction that had led me there. So one day I asked to see one of the lecturers and told him of my situation-of being torn daily and the anxiety it was bringing me. His answer was not one of let’s look how you got here or working through things but simply “it seems you have a faith problem”. I’ve been called many things in my life, but that hadn’t been one of them. But over the following weeks and months I got it. Yes, I knew who Christ was and what he came for. The son of God, the saviour of the world and even me. But I got it. I was so wanting to follow what he wanted that it was getting in the way and yes I was continually asking Him, but also myself and then rationalising it with my human mind and I’d be back at the start again which was like, maybe I was only there because I was like Whoopi Goldberg in the movie nuns on the run where she only went to the nunnery because she was boxed in by the stuff she had done and was there by default. And maybe I was right, but maybe also, that’s what had to happen. Maybe that’s what had to happen to see through the eyes like the jailor in today’s reading from acts. To where you are brought to the brink, think of all the options and realise you have none and have a seemingly simple but nevertheless, unfathomable choice. To either follow what seems the logical outcome to destruction, or just give all that has gone before and lay ourselves at His mercy-say “what must I do”. I’m done-What must I do to save me from myself? What must I do to take away the guilt? What must I do? I’ll climb mountains. I’ll do anything to start again. I’ll beg for mercy and if the only way to see some peace is to end it, then let it end because this world is too hard for me, no rather-I’m not strong enough to fight the world, to fight what I’ve done and what I’ve become. To be trapped like the jailor in Acts. What must I do to be saved? The question “what one must do?” is perhaps a very natural response for humanity. The jailer faced death, because the prison had become unsecured under his watch. He was frightened, humiliated, and his immediate response, before Paul stopped him, was to take his life. And His answer “Believe in the Lord Jesus and you will be saved”. Saved eternally-Yes, but also saved today-from yourself. If you let go of the Word you are doomed because then it comes back to us, of how we feel inside. The Word of God comes from outside and is not accountable to how we feel-it remains resolute and does not change. We are in the great tribulation-trouble, trial and ordeal. And in that things get confusing to us but not to the Lord. He sees every self-doubt and burden we carry-and that he knows they are heavy-he offers no catches or tricks. That we make it through this great tribulation still in faith even astonishes the angels. Our Lord’s offer is simple because there is no other way but belief in Him, the Lord Jesus Christ our Saviour and to be washed clean in his blood. We ask our Lord for forgiveness and most certainly are given eternal life. We ask each other for forgiveness that we may be free today, and today-I beg of your forgiveness. In 2009 a group of researchers in Hungary found that the saying “it’s a fine line between genius and madness” is genetically accurate and identified this as an explanation of why people such as Vincent van Gogh displayed such destructive behavior. Yet when you hear a moving and emotional song or maybe sometimes a piece of advice or a viewpoint- you know that the author has lived it, both through it and with it. The genes we are born with verses the environment and experiences we bear as the determining factor of who we become has long been debated, and while one person’s view I read that “genetics provides the clay, but the environment shapes” seems a reasonable and logical conclusion, it was of little practical use for a women I knew who was intelligent, very successful and happily married with great kids, but who up till she could no longer-stated that she fought her madness every day. Yet for many, the studies of who we are and why, then research into appropriate medicines for both physical and mental ailments has been life altering if not life-saving, and while I personally believe some of our modern day advancements have been far from beneficial, after having walked through old cemeteries and seen the amount of head stones for both mother and baby lost during child birth, I thank God for those that he has given the passion, determination and intelligence to make our world a better place. God provides and in today’s Gospel Jesus tells his disciples, tells us that “he has given us his peace, but not as the world gives us peace”. The peace of the Lord “that releases us from distress and fear”. The peace of the Lord that sets us free. Oh to know that peace for but a moment. On the way home after the funeral of the lady I have spoken of, I heard this song- a conversation between a troubled soul and our Savior. Somehow you’ll find you are there. For some, peace can only be seen at the end, but oh to only know that peace now, even if but for a moment. But for a moment to be able to accept ourselves unconditionally like our Saviour does. But for a moment to accept ourselves as he accepts us and live in peace knowing of his covenant and the unbreakable agreement that he has brought to us from the Father. An unconditional covenant taken like that between David and King Saul’s son Jonathon, that should one of them perish, the other would care for the others offspring. A covenant realised after both Saul and Jonathan had been slain by the Philistines and what little remained of the House of Saul went into hiding with David being made King of Israel. After a few years had passed, David learns that Jonathan had a son, Mephibosheth, a crippled youth surviving in the squalor of an outcast camp. Because of his covenant with Jonathan, David has the young crippled boy bought to him, and not only restores his land but invites him to always dine with him amid the splendour of the king’s table. And so it was that the poor, lame boy, now a man returned to the splendour of the royal table. We too, sometimes to accept what is there, must walk in the wilderness carrying the burdens of both our genetic and earthly formations. The monkey on our back that won’t be dislodged as it whispers to us words of destruction and ruin, and at best with the only remaining strength we have left, hang on with feeble scar tissued hands to endure it and hope to one day know of that peace that the Lord speaks off, to again be that innocent child who knew not of what has come to be. Sometimes, only after the journey through the wilderness do the words from the book of Romans let us understand “that endurance produces character, and character produces hope”. The unseen hope that was there before we were born, the unseen hope in the depths of our despairs, yet the small ray of hope searched for and clung to in our times of endurance. Endurance to be suffered like that of Methibosheth, and like Methibosheth amongst it we see the truth of what was there from the start. And know the place for the first time”. We too, after having travelled through the journey of our lives, the ups and the downs, the joyous and the desolate-after our exploration of this world and ourselves come to know the place from where we started from for the first time. That He has told us that “Before I formed you in the womb I knew you”, and during our path “The LORD will guide you continually, giving you water when you are dry and restoring your strength. You will be like a well-watered garden, like an ever-flowing spring” until that day when our peace will be complete. The Lord has told us that he “is our refuge and strength and a very present help in trouble”, and though we suffer experiences and pain that we carry with us through our earthly time that may or may not bring us peace, and though on our journey we may not gain peace as the world knows it, we have the peace that he offers, the peace brought to us from the pain suffered by our Saviour Jesus on the Cross. The pain he bore for us “that if the Son shall make you free, you shall be free indeed”. His endurance that gave us character, and his character that brought us the sure hope of salvation. The pain he endured for us, that until we meet again on the last day allows us to be free amidst a turbulent world-and free amidst the turbulence of the struggles which we carry. To know that regardless of what we know of ourselves, to know that Christ died for us is to bring the sureness of salvation and eternal life. To know that regardless of what we have become, that in faith in him alone he has accepted us unconditionally give us freedom and peace today, and while we may not be able to dance like nobodies watching, we can still dance. While we may not be able to love like we’ll never be hurt, we can still love, and while we may not be able to sing like nobody’s listening, we can still sing-because we have heard him speak from his heart and ask that we lay our heavy burdens on him. So live today and rest in his peace – knowing of the sure freedom, that to you he has bought with his life, and to you he has brought with his love.